An Visure Requirements license is needed to run the Visure Requirements Client. Additionally, another license is needed to run the Administration Center (installed along with Visure Requirements) so two licenses are needed if both applications are used simultaneously. The license used by the Administration Center will be the same as the one used by the Visure Requirements Client. There are two types of licenses available, users must choose between them depending on their available infrastructure and the usual utilization of the tool. Each license requires a different installation (see Type of Installations). This license allows to execute Visure Requirements Client and the Administration Center in one specific computer. The license is fixed to that machine. Usually these licenses are used by computer not connected to a network, for example, laptops. This license is attached to the installation of a local client. This license allows to execute Visure Requirements Client and the Administration Center in one computer. 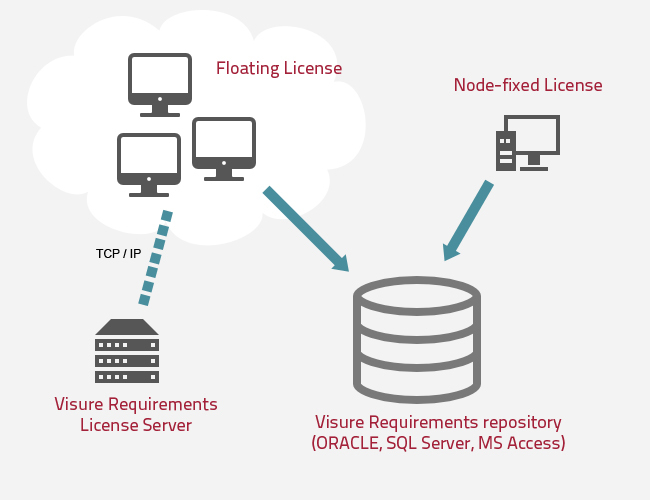 During the execution of Visure Requirements the floating license is blocked, but once the execution is finished the license is free to be used by another user. These licenses are supplied by a license server and used by Visure Requirements Client that will be connected to that server. Usually, a license Server will have N floating licenses, which means that only N clients can be run simultaneously. These licenses is bounded to the installation of a License Server and at least one Visure Requirements Client (connected to a network). A local client will be installed. A node locked license will be needed for this installation. Selecting this type of installation the tool will only be available from the computer where you installed it. Each client will need a floating license to be executed. Those licenses are served by the License Server. When using a node locked license a License Server is not needed. When installing Visure Requirements you can chose to do it in network mode or in local mode. When installing the Visure Requirements license Server a new service will be registered in the system called "Visure Requirements License Server" This services must be running in order for the License Server to work. Every computer with an Visure Requirements Client installed in network mode may connect to a license Server to get a license.